Kids want friends and most of them end up having friends. Some don’t and, of those that do, their friends come and go. It isn’t easy to have lasting friends. Interests change as do schools and home addresses. Still, it’s possible to teach students to be friendly and that will help to ensure many friends and quality friendships that last. Mt. 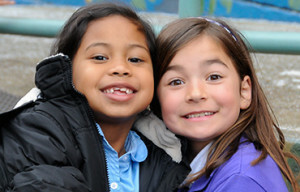 Helix Academy is unique in that we actively teach our students to be friendly.